We're so grateful for your support and we know we have to continue to earn it every day. 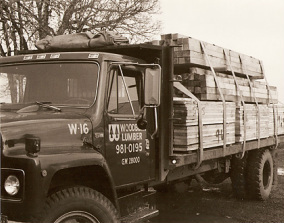 In 1928, Lee and Ann Withers bought a part interest in a sawmill in Woodburn that was then called Livesay–Withers Lumber. They relocated from McMinnville to Woodburn and quickly became part of the new community where they would spend the rest of their lives. Mr. Livesay ran the sawmill while Lee Withers handled the bookkeeping and retail & contractor sales office. Two important events would change the thriving partnership. First, in 1929 the stock market crash plunged the country into depression. Then in 1931, J.W. Copeland came to Woodburn and told Mr. Livesay and Lee Withers that if they didn’t sell their lumberyard to him that he would open a yard across the street and run them out of business. The young partners welcomed the challenge. But it didn’t work very well for long. Copeland took enough business in the small town that Livesay-Withers could not survive and they went ahead and sold. Lee and Ann then went to Mt. Angel, eight miles away, and started again. This was now in the depths of the depression. Times were very tough, but they were determined to succeed as Mt. Angel Lumber. Sales records still exist of this time. In fact, in May 1931 sales were $13.81 for the entire month. The Withers decided to knock on every door in town and introduce themselves and ask for the community’s support as they struggled to keep the doors open. With the loyalty and support of many people things got a little better and they managed to get by. In 1934 it was Copeland’s turn to fall on hard times and their Woodburn store was put up for sale. Lee and Ann borrowed all they could from family and friends and bought the yard. 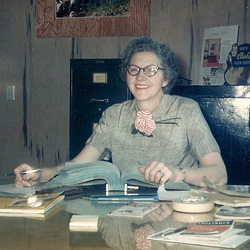 Now with two lumber yards, Ann came to work with Lee at the Mt. Angel yard and took care of payables and receivables and as the community liaison— she had the personality to build relationships! 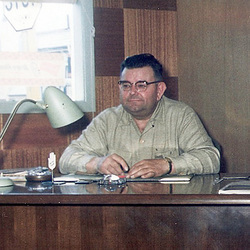 The Woodburn location was manned by their first employee, Fred Hurris. All during the depression and most of World War II, this is how the yards operated. All of our contractor customers had their own keys so if Lee or Fred were gone they’d simply come in, take what they needed and leave a note. As the 50s began, both Woodburn and Mt. Angel yards started to grow and more people were hired. Both locations hired local folks and were vital parts of the community, especially if a church needed to be built or a barn raised. In 1962, eldest son Bob came home from the service and went to work full-time in the same town where he had grown up. 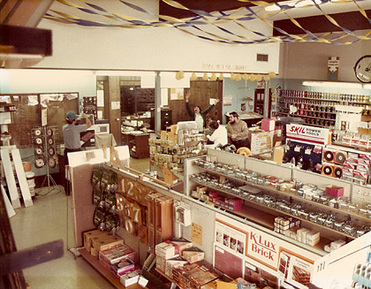 The Woodburn store was now the much larger of the two locations and Lee, Ann, and Bob all worked there along with about 10 other employees. There were so many colorful characters like “Shorty”, “Slim” and “Big” Bob Wellman, who lived and worked in the communities and really made the company what it is. A small but still big enough local company with local people. 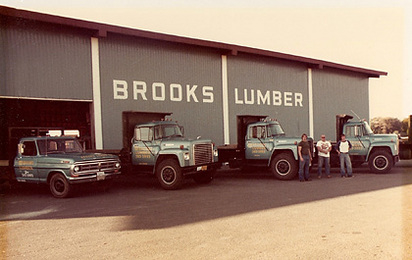 Son Bob took over in 1964 and opened Brooks Lumber in 1965. Brooks served the Salem area and quickly became the highest volume yard but it was still the employees who made it a fun to work and fun to shop company. In 1998 Bob retired and Son Trent took the reins. As the company entered its third generation, more expansion took place: the Silverton store opened in 2004, followed by Molalla in 2010. In the beginning... interior of Withers Lumber store in the 1960s. One thing has never changed after all these years: Withers Lumber strives to open facilities in small communities staffed with local people. We believe that if you simply find the best, most honest and hardworking people who enjoy helping others then you will be appreciated and supported by your community. At Withers Lumber, our job is to help others do what they want to do. Good teams is how we do it. And we think you’ll enjoy our people and products no matter which store you frequent— Brooks/Salem or Molalla or Silverton. We’re so grateful for your support and we know we have to continue to earn it every day.